Ipilimumab is also known by its brand name Yervoy. It is a sort of monoclonal antibody that is a type of biological therapy for treating melanoma that has extended deeply into the skin and cannot be removed or it has spread to a further part of the body. Yervoy is an helpful and revolutionary drug. Yervoy (Ipilimumab) is a product by Bristol-Myers Squibb, is a human cytotoxic T-lymphocyte antigen 4 (CTLA-4)-blocking antibody, approved for the treatment of metastatic melanoma. CTLA-4 is a down regulator of T-cell activation pathways. It allows for improved T-cell activation, propagation and lymphocyte infiltration into tumors leading to cell death. It has a novel mechanism of action, stimulating the body’s immune system to target and destroy the tumor. Ipilimumab is the preliminary agent yet verified to perk up survival in advanced melanoma. It gives them more time, which for patients with advanced melanoma, is huge. Melanoma is the leading cause of death from skin disease characterized by the uncontrolled growth of pigment-producing cells (melanocytes) located in the skin. Melanoma is classified as stage III when it has reached one or more lymph nodes a cancer originating in melanocytes. It is the most fatal form of skin cancer and the sixth leading type of cancer in the U.S. During the past 30 years, the annual incidence of melanoma in the U.S. has grown by more than 60%. Melanoma is an immunogenic cancer. The patients having metastatic melanoma Yervoy (ipilimumab) is the first treatment works by indirectly mediating T-cell immune reaction against tumors. The Yervoy has many serious side effects and the side effects are most likely to begin during treatment; however, can show up months after your last infusion. The most common side effects of Yervoy reported are rash, diarrhea, fatigue, itching, headache, weight loss, nausea and is also contraindicated in pregnancy because Yervoy may cause premature delivery, stillbirth, and death of an unborn baby. The treatment can lead to inflammation of the intestines causing colitis; inflammation of the nerves cause paralysis, inflammation of the liver may cause liver failure, severe skin reactions, and inflammation of the glands (pituitary, adrenal, and thyroid glands). Along with these severe side effects, there are various trivial side effects of Yervoy that can cause daily discomfort to patients. Another disadvantage of Yervoy is that it is not permitted for use in patients under the age of 18. The side effects of Yervoy can be managed by medication but signs and symptoms appears are not addressed timely the condition may get worse even leading to life threatening stage. 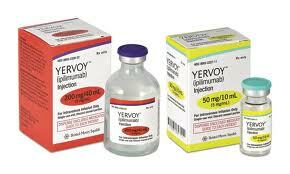 Yervoy is used to treat melanoma that cannot be treated with surgery. The response to ipilimumab may be delayed for months and that they can even arise after the initial progression or development of new lesions. Patients should be initially assessed for reaction after 12 weeks of therapy. Yervoy is a sterile, preservative-free, clear to slightly opalescent, colorless to pale yellow solution for infusion, which may contain a small amount of visible translucent-to-white, amorphous ipilimumab particulates. Yervoy is injected into a vein through an IV and must be given slowly. The Yervoy IV infusion can take about 90 minutes to complete. Yervoy is usually given up to 4 doses under the strict instructions of doctor. The recommended dose and schedule for ipilimumab is 3 mg/kg as an intravenous infusion every 3 weeks. In progress information suggests that ipilimumab be permanently discontinued if persistent moderate adverse reactions occur; the patient fails to complete the full treatment course within 16 weeks after receiving the first dose; or severe or life-threatening reactions occur. The drug Yervoy Bristol-Myers Squibb Co’s is a so-called bispecific antibody, a hot emerging technology that could prove more potent than conventional antibodies, which have become mainstay treatments for a wide array of cancers. Other costly immuno-oncology drugs, which work by harnessing the immune system, include Yervoy (Ipilimumab) treatment for melanoma. The new treatment with Ipilimumab involves an infusion of two different antibodies that “takes the brakes off” the immune system, allowing it to look for and destroy malignant cells. The Yervoy (Ipilimumab) treatment is pricey and researchers also suggest further studies in using Ipilimumab for treatments. Yervoy (Ipilimumab) costs about $120,000 for a complete course of four infusions. The effectiveness of Yervoy (Ipilimumab) may also demands doctor and patient awareness to reduce morbidity and treatment costs and true ipilimumab effectiveness may also be dictated by both controlling severe side effects and objective tumor responses.